Research coordinated by Carlos III University in Madrid analyzes the images of women in Roman mosaics and their impact on the collective consciousness of feminine stereotypes. In many cases, the research concludes, the images pointed to the female as the cause of wars and other evils. Numerous images of women appear in Roman mosaics. The majority are inspired in mythology  goddess, heroines and other protagonists of countless legends  although other flesh and blood women, probably dominae, their daughters, handmaidens and servants, are also documented. "The most significant aspect of these images is the different roles they reflect and their contribution to the construction of certain stereotypes, not just in the Roman world, but also throughout history and up to the present", points out Luz Neira, Associate Professor of Ancient History in the Department of Humanities: History, Geography and Art, and a researcher at UC3M's Institute of Culture and Technology. 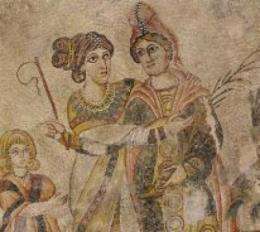 The roles of the women that appear in the mosaics can be classified into three broad groups, according to the researchers. First, there are those that depict the roles of wife, mother and daughter, reflecting fidelity, concern for children and unquestioning obedience to parents (positive examples in that era), although there are also images of opposite behavior with an instructional purpose; these seem to allude to the terrible consequences that may befall those who behave in such a manner. In the second group, other images use nudes to evoke eroticism and even wild unions that guarantee pleasure and enjoyment, compared with more civilized unions to be found within the bonds of marriage. In the third and final place, there are some mythological representations that seem to reflect a different sensibility, as in the case of certain heroines, who were willing to do anything rather than fall into the arms of a man, even if he was a god, or the Amazons who hunted and competed with celebrated heroes. "It is interesting to see how, points out Professor Luz Neira in many of these images, regardless of the roles they depict, the female is shown to be the cause of wars and other evils, following a tradition that, referred to by the poet Hesiod as far back as the seventh century B.C, dates back to the myth of de Pandora". Numerous graphic examples of this type can be found in the book that was recently published under the direction and scientific coordination of Luz Neira, Representaciones de mujeres en los mosaicos romanos y su impacto en el imaginario de estereotipos femeninos (Images of women in Roman mosaics and their impact on the imagery of feminine stereotypes - Ed. Creaciones Vincent Gabrielle, 2011). From a perspective that avoids considering images as a mere illustrations, this work deals with the analysis and debate of the different roles of women as they are reflected in Roman mosaics, "rejecting the out-dated idea of an unconscious use of archetypes and models that holds no historic significance". The volume includes the work of prestigious Spanish and foreign researchers, with numerous studies on the subject. This line of research, which is part of the wider Project "Sociedad y economía en los mosaicos hispanorromanos II" (Society and economy in hispanoroman mosaics II), of the Programa Nacional de Humanidades de la Comisión Interministerial de Ciencia y Tecnología (CICYT  National Program for the Humanities of the Interministerial Commission on Science and Technology), invites us to reflect on the significance of the mosaics' images and their relationship with the ideology of the elites during the Roman Empire. "Keeping in mind that the mosaics tiled the rooms in the residences of the most privileged members of the elite classes, whose opinion would have been essential in choosing scenes and motifs, the evocation of very concrete stereotypes, which in many cases would have been the fruit of conscious, premeditated choices on the part of domini, stands out", states Luz Neira. In this way, the research is intended to highlight the idea that those stereotypes, whose validity appeared to be reinforced by their old age alone, were the result of self-interested construction and dissemination; thus, the mosaics shed even more light on the mentality of the elites than they do on the situations and circumstances experienced by women living in Imperial Rome. More information: Images of women in Roman mosaics and their impact on the imagery of feminine stereotypes, Luz Neira (coordination and editing). Ed. Creaciones Vincent Gabrielle (CVG), Madrid, 2011. Do women have what it takes?